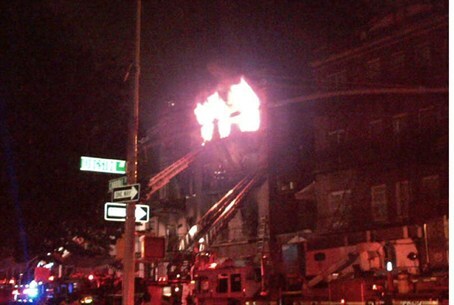 An “open miracle” occurred in Crown Heights overnight Monday morning when everyone escaped with their lives from a blazing building. An “open miracle” occurred in the wee hours of Monday morning when everyone escaped with their lives from the blazing second floor of a burning apartment building in the very heart of the Chabad-Lubavitch neighborhood in Crown Heights, Brooklyn. The four-story building on Carroll Street and Kingston Avenue, which also houses a dormitory, apparently burst into flames at about 2:30 a.m. The older Jewish students, who were immediately awakened by smoke detectors, raised the alarm and helped evacuate residents from the building, saving numerous lives that might otherwise have been lost to the flames. A few people had to be treated at the scene for smoke inhalation and other minor injuries. The fact that all of the residents, most of whom were Jews, managed to escape and nearly all were uninjured – was miraculous, according to one eyewitness at the scene. Elchanan, a resident of Crown Heights, told Arutz Sheva the building is located in the very heart of the Jewish section of the neighborhood, where already thousands of Jews are beginning to arrive from around the world in anticipation of the Hebrew holiday month of Tishrei. The neighborhood is home base to the world headquarters of the Chabad-Lubavitch Chassidic movement. "It was an open miracle that no tragedy occurred here,” he said. Several firefighters, however, were injured while fighting the four-alarm blaze, including some who were taken to hospital. One suffered serious burns. The structure has once before been struck by tragedy: it was the very same building that caught fire just a few months ago, on the Jewish holiday of Shavuot. The “coincidence” has raised red flags for officials, who have opened an investigation into the blaze, which they labeled suspicious due to how quickly the flames raced through the building.